Jaipur, 22 March: As a part of the ongoing performing arts festival ‘Navras’, popularly known Bijji, Rajasthan’s noted writer and Sahitya Akademi Awardee Vijaydan Detha’s stories were read out today at Navras. 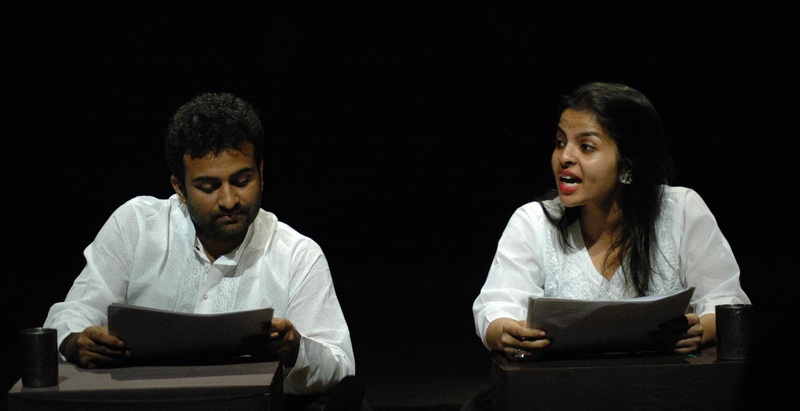 Graduates from National School of Drama, Ipshita Chakraborty and Ajeet Singh Palawat read out Detha’s Kenchuli and Mooji Surma in a poignant manner. The book reading consisted of two stories read out from Bijji ka Hafta. In the first story Kenchuli, Laachi’s beauty infatuated Bhoja. Much to Lacchi’s frustration her husband, Gujjar remained unware of Bhoja repeatedly trying on her. Although Laachi kept trying to make Gujjar see that lecherous actions of Bhoja he continued to believed Bhoja’s cleverly weaved stories and rebuked Laachi for her foolishness. When Laachi comes across a snake struggling trying to lose its skin (Kenchuli) she realizes that the Kenchuli is what weighs a person down in life. In the second story Soorma, Sethji nature as a true miser challenges the demanding nature of Goddess Lamxi in the form of a Panda (Pandit). Goddess keeps testing Sethji trying to get him to break his principles and reward the Panda with alms (Seedha). However, Sethji adheres to his principles and doesn’t break down pleasing the Goddess immensely. Also discussed were the various symbols used in the play – father – son relationship, ghost-ghost relationship, senior artiste – junior artiste relationship and effective use of light. The time era the play was being held, the emotional value of a scene and the position of characters on stage are all important factors when planning the ‘Light Design’ in this play said Director of the India Foundation for the Arts, Anmol Vellani. While discussing the ‘Music’, singer-songwriter, Abhijeet Tambe said “The music brief was created on the basis of the time setting in the play, which in this case was the late 60s”. He chose the Harmonium and programmed in electronically to ensure that the director’s instruction of infusing modernity in the music was also accomplished. Elements such as— play within a play concept and the position of the audience played a major role in the ‘Sound Design’ of the play. Four surround sound speakers were attached imagining the position of the audience in a floating space.